When you install the Dashlane application on your desktop, Dashlane automatically proposes to install extensions within your browsers. If the application is where your data is stored and where the cryptographic magic happens, the browser extensions are doing all the work when it comes to interacting with the internet, for example when Dashlane autofills your passwords and forms. So far so good, but how does the application know it's securely connected to the right extension, and the extension to the right application? That's where pairing comes in. Pairing is a way for both sides of the Dashlane desktop equation to securely establish each other's identity. Normally the pairing between the application and its extensions happens in the background when you install Dashlane, and is checked every time you open the application. You have nothing to do but enjoy your Dashlane. First-time users might notice the pairing process open and close a window, but otherwise the process is invisible. However, there are situations when you will need to manually pair the application and an extension. This happens when you install a new browser, if you reinstall the application or one of the extensions, or if the background authentication encounters any difficulties. 1. A page in your browser with a 6-digit number, such as in the example here. 2. A popup from your Dashlane application, also with a 6-digit number, as in this example. Note that when they first appear, the popup may appear over the top of the web page. Simply move it to the side if this is the case in order to see the 6-digit numbers on both the browser page and the popup. 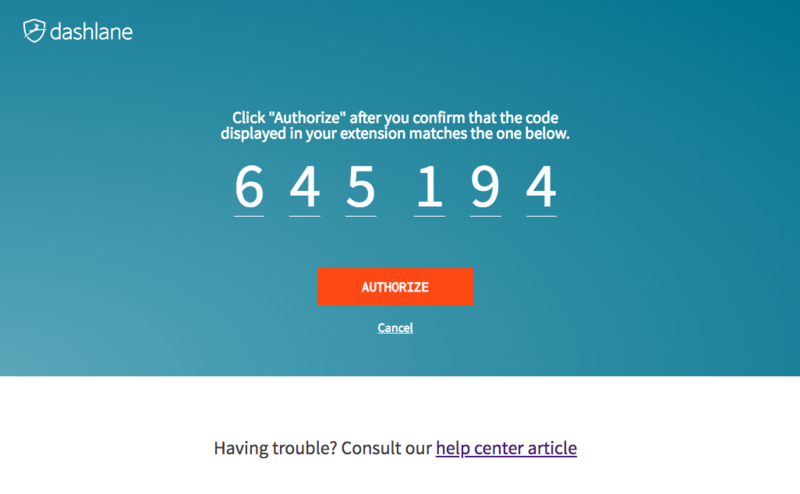 Your job is to confirm that the two 6-digit codes are identical, then click on "authorize" in both the browser window and the popup. And that's it, you're paired! Note that some browsers allow you to have multiple user profiles. In this case, one will pair automatically, but you will have to manually pair the others. Note also that all users installing Dashlane through the Mac App Store will need to go through the manual pairing process. If you don't know if you downloaded Dashlane through the Mac App Store, or else downloaded it directly from our website, click on the "Help" application menu. If you see an option to "Uninstall Dashlane..." at the bottom of the dropdown menu, you downloaded Dashlane directly from our website. If you do not see that option, you are using a copy from the Mac App Store. If you click "authorize" on only one of the two windows, for example by authorizing the popup but then closing the browser by accident, simply quit and reopen your browser to re-start the pairing process. If you accidentally click on "Cancel" on one of the two windows, cancel the other window then quit and reopen your browser to re-start the process. Note that if you have disabled popups in your browser, you must allow popups from Dashlane for the pairing process to function properly. Note also that if your browser extension has been updated but your Dashlane application is out of date, when you attempt to pair the two you will be given the following error message. Please update your Dashlane application to enable proper pairing. Please see our minimum requirements to see if your current configuration is compatible. 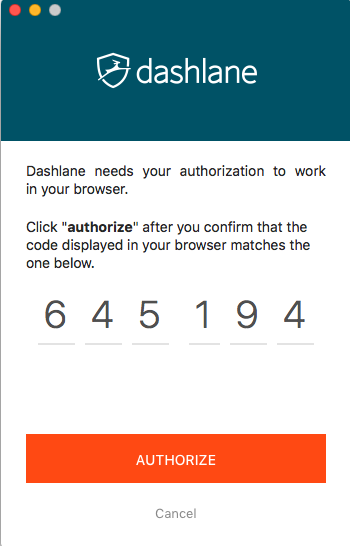 Once you have verified that your Dashlane app and extensions are up-to-date, if you encounter any further difficulty, or if you still see different results between the popup and webpage, please contact our User Support.